Why is Nabeel Rajab a repeated target of the Bahraini authorities? Nabeel Rajab is due to stand trial this week for critical comments he made online of the Bahraini authorities. He has been a direct target of repression within the country for over a decade. Nabeel Rajab, the Bahraini human rights activist and Index on Censorship award winner, was due to stand trial on 2 August – now postponed until 5 September – over comments he made on Twitter criticising government institutions. In Bahrain, such comments can land you in jail, as Rajab has seen before, having spent two years behind bars for tweets made in 2012. Index looks at how Rajab has been treated by the Bahraini authorities over the years. Rajab became involved in the uprisings in Bahrain of the 1990s to demand democratic reforms within the country. Rajab co-founded the Bahrain Human Rights Society to strengthen calls for democratic reforms. Rajab worked with Abdulhadi al-Khawaja and others to found the Bahrain Centre for Human Rights, an NGO to promote human rights in Bahrain. Rajab suffered a spinal injury, fractured arm, broken finger and head injury after being attacked by Bahraini’s Special Security Force Command while attending a peaceful rally by the Committee for the Unemployed to protest against the government’s management of unemployment levels. During a government crackdown on dissent in the summer of 2010, Rajab’s photograph was published a number of times in the pro-government publication Al-Watan, accusing him of supporting terrorists and publishing false information. Other publications followed suit. On 8 September, a warrant for his arrest was issued and he was subject to a travel ban. Just over a week later, these were dropped. During the 2011 Arab Spring, Bahrain’s monarchy faced serious threats. As a result, even peaceful demonstrators were met with brutal government repression, leaving over 30 dead. Rajab had been a leading voice during the Bahraini uprising, and many associated with him faced a backlash. Even members of CNN’s news team were arrested by the government’s security forces as they visited his house in April. “Twenty men in black ski masks are reported to have surrounded the news team and confiscated their recording equipment,” Index reported at the time. In June, Rajab was summoned to a military court just hours before Bahrain was due to lift its emergency law, which saw the arrival of Saudi troops in Bahrain to help crush the peaceful protests. Rajab then went missing for several of days. On 6 January 2012, Rajab was hospitalised being beaten by security forces after leading a protest in Manama and briefly detained. On 12 February he was briefly detained after he tried to march to the location of the Pearl Roundabout in Manama, where government forces cracked down on protesters during the 2011 uprising. In March, the Bahrain Centre for Human Rights won Index on Censorship’s Freedom of Expression Award for advocacy, which recognises campaigners who fight repression. In April, Bahrain hosted the annual Formula One Grand Prix. Following the negative media coverage around the event, Bahraini authorities stepped up their suppression of the country’s protest movement. During this time, Rajab was arrested and released several times. 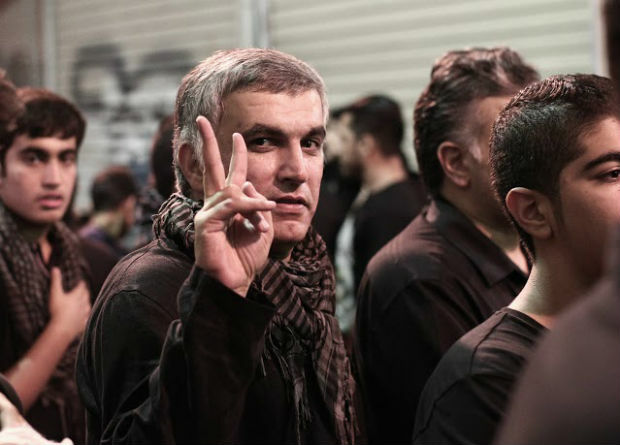 On 5 May, Rajab was arrested at Bahrain International Airport on his arrival from Lebanon the day before the scheduled court hearing relating to a protest he had attended in March. The following day, he was charged with “insulting a statutory body of Twitter”. He was released on 28 May but re-arrested on 7 June, and in July was sentenced to three months in prison for allegedly defamatory tweets. On 16 August he was sentenced to three years in prison for charges related to “illegal gathering”. Between 2012 and 2014, Rajab spent two years behind bars. In October 2014, a court ruled that Rajab would face criminal charges stemming from a single tweet in which both the ministry of interior and the ministry of defence allege that he “denigrated government institutions”. Rajab faced up to six years in prison. He was due to stand trial on 19 October. It was adjourned until 29 November and he was denied bail. In November it was adjourned again until 20 January 2015 and Rajab was freed without bail. When Rajab finally stood trial on 20 January, he was sentenced to six months in prison, which was suspended pending a fine. He was granted bail while he appealed the verdict. It wasn’t long before he was summoned by police again, and fresh fears emerged of his arrest. On 26 February, he wrote an email to supporters which read: “Just to inform you that I was summoned today morning to attend the police station at the same time – and I came to know that the new charge against me will incitement of hatred against the regime.” In early April he was arrested, again for comments made online. While his appeal date was set for 15 March, it was repeatedly postponed. On 14 July, the Bahraini king pardoned Rajab three months into a six-month sentence for the tweet. According to Bahrain’s official news agency, this was over fears for his health. Back in January, Rajab was given an arbitrary travel ban. Index, along with other NGOs, called for this ban to be lifted so that he could travel abroad with his family to secure medical assistance for his wife, Sumaya Rajab. On 13 June, he was taken from his home early in the morning and his electronic devices were seized. The next day, he was charged with “spreading false news” and has been in detention since, awaiting trial. After 15 days in solitary confinement, Rajab was hospitalised in late June. On 7 July, the European Parliament adopted a resolution condemning recent human rights abuses in Bahrain and called for an end to the ongoing repression against the country’s human rights defenders, political opposition and civil society. A few days later, a coalition of international NGOs, including Index on Censorship, condemned Bahrain’s treatment of Rajab.